Syngenta contributes to the economies and communities where we operate and our people are part of these communities. We respond to concerns, contribute to local needs and look to provide lasting benefit to these communities. Our commitment to supporting local communities is set out in the Syngenta Code of Conduct. The biggest impact we make is through our products and services which help improve financial and nutritional food security for millions of people. Our Sparsh project focuses on prioritized community needs and is currently working with women members of the surrounding society under Self Help Groups (SHG). Each group consisting of 10 to 20 women is provided with training on livelihood skills such as flower making, painting, cooking, and beautician courses, based on their interests. In a span of 3 years, over 2000 women are now part of these SHGs. Some of the other activities that SPARSH undertakes are solid waste management projects in two village panchayats reaching about 1200 families, skill development of youth, health and hygiene in the surrounding villages with specific focus on controlling vector borne diseases. We have supported the local primary health center by providing them a health van and also helped develop their infrastructure. 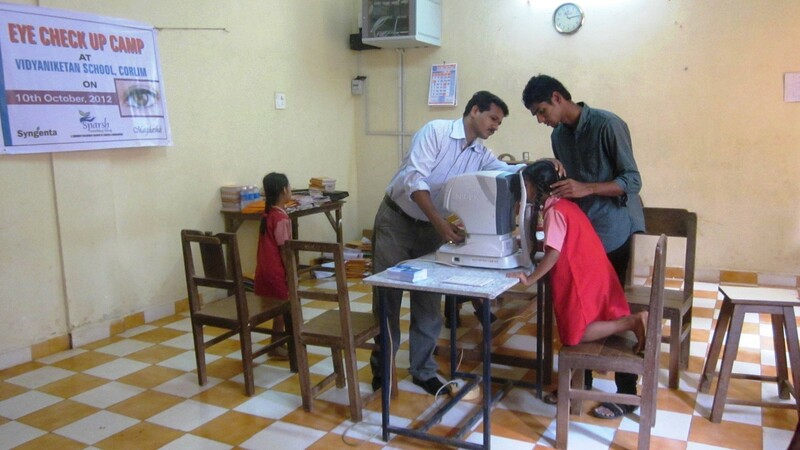 Our efforts have reached beyond community and we are now supporting more than 50 NGO’s which provide social and educational assistance to people. Syngenta “Krishi Mitr” was established with the purpose of engaging with the Goan Agriculture Community by developing a positive attitude towards farming using innovative crop solution and good agriculture practices. SKM is now helping more than 500 smallholders in 50 villages and is fast becoming a resource centre for agriculture. SKM has focused on crops like cashew, areca nut, coconut, mango and vegetables. A key achievement has been growing potatoes in Goa for the first time in 2010 -11. Krishi Mitr also demonstrated profitable chili cultivation in Goa through its Chili Project spread over 8 acres in three villages: Amona, Sal and Valpoi. Syngenta has supported nearly 44 farmers involved in the project by developing saplings, giving agronomy advice and providing machinery and equipment like irrigation pumps, spray pumps and tractors. Projects like watermelon and chilli development have helped about 40 farmers convert their fallow land into arable. A highlight of SKM is the “Crop Cafeteria” where the company demonstrates best practices in cultivation to farmers. 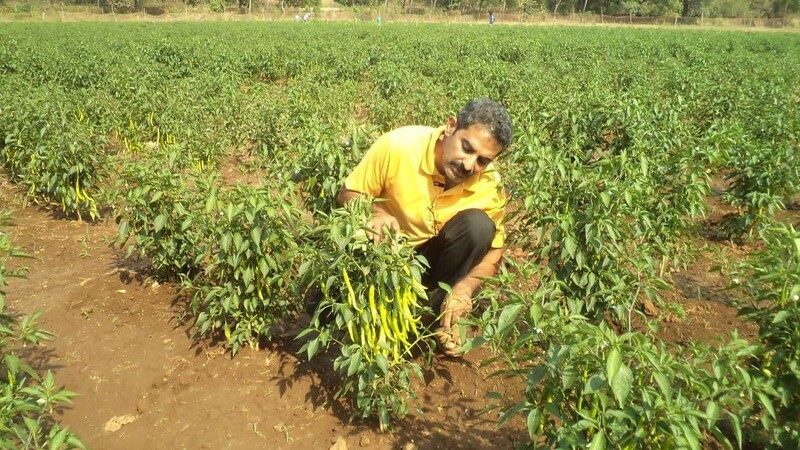 Manjunath Hegde started cultivating chillis under the guidance of Syngenta Krishi Mitr in the last Rabi season on a 7000 sq metre plot at Collem near Dharbandora, Goa. So far he has harvested more than 8 tons of chilli and sold it to the Horticulture department. He spent about Rs 1.2 lakhs on cultivation and earned more than Rs. 2.5 lakhs. He intends to grow more chillis in the next season using Syngenta Krishi Mitr’s advise. 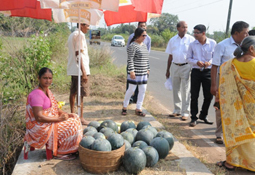 Parra village in North Goa is traditionally known for its watermelons. The specialty of the village is the ‘grower and buyer connect’. 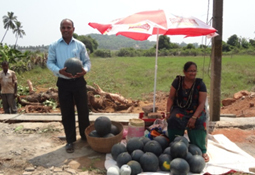 Here people can purchase watermelons directly from the farms at a good price. Seeing the prosperity of the watermelon growers no one could have guessed that a couple of years ago they had almost stopped cultivating the crop due to stagnant yields and declining fruit quality. In 2014 Syngenta Santa Monica Works stepped in to support these watermelon growers under its SKM initiative. The SKM team got the local village panchayat on board and trained 32 farmers on the best practices for growing watermelons using Syngenta’s popular hybrid Augusta. This experiment resulted in increased yield and superior fruit quality. In 2015, on the growers’ demand, SKM team supported 30 farmers of Parra village who cultivated watermelon in an area of 7 acres leading to a fantastic harvest.